and that a small group of determined people can change the course of history." Sometimes you'd be surprised how much you can accomplish if you only try. You just might not see the results immediately. This is as true when we're talking about keeping our favorite parks open as it is in any other matter that is important to us. If you live in a state that is considering closing some or all of its parks, there are several things you can do to help prevent closures. These suggestions are applicable to local and national parks, too. 1. Let your governor, legislators, county commissioner, parks boards, and other elected or appointed officials know your opinions about what services you think should be cut and what services are important to you. If you think parks should be closed, tell them. If not, be courteous and clear and tell them why you want them to stay open. Even better, give them one or more reasonable solutions. They aren't recommending park closures just to make people miserable; they may believe they don't have any other options. Be creative and suggest some viable alternatives. But what can one person do, you ask? A bunch, especially when combined with enough other individuals who wondered how one person can effectively change something. Here are two examples of how original government park proposals were modified when the public voiced enough opposition. The response from the public--more than 4,000 comments--universally opposing the rate changes, convinced [Forest Service Chief] Tidwell that the proposed changes were not the best way to address services provided by private contractors at Forest Service recreation sites. I can't believe as few as 4,000 comments changed their minds! No, I didn't comment because I wasn't strongly opposed to the idea. Funds need to be raised somehow. This is one instance where I think it's only fair that the people who use these services (like Jim and me) pay for them rather than increasing taxes on everyone. But I'm not complaining that the fees aren't going up, since so many other fees are. Last May California's governor proposed closing 220 of 278 state parks to help reduce the $20-billion-dollar state deficit but backed off after extensive protests from residents and visitors. More recently he recommended expanding oil drilling off the Santa Barbara coast to provide up to $140 million for state parks in place of state funding. I'm sure some folks will protest that, too! 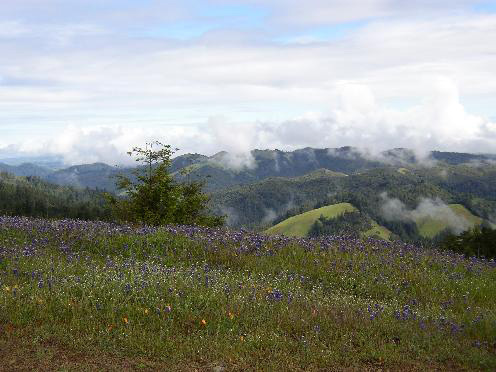 In addition, the California State Parks Association is working diligently to gather enough signatures to add an initiative on the November state ballot for voters to decide if there will be a new $18 annual fee imposed on all vehicle licenses. The proposed State Park Access Pass would help provide funds for the state parks and (I think I read) allow residents free entrance to them. 2. 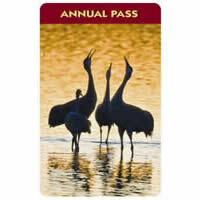 Visit the parks you care about regularly and purchase an annual pass, if one is available. OK, this suggestion will cost you some dollars but I think those dollars are well-spent. You'll more than get your money's worth. "America the Beautiful" National Parks and Federal Recreational Lands passes are a good way to start. 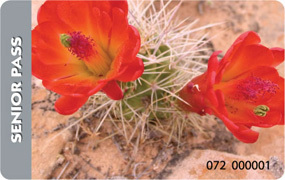 They give you and your family access for one year to any Federal recreational sites (National Park, Forest Service, Fish & Wildlife, Bureau of Land Management (BLM), Bureau of Land Reclamation) that charge an entry or standard amenity fee. Costs for these passes range from free for volunteers who give more than 500 hours of their time and for people with permanent disabilities . . . to $10 for a lifetime pass for folks over age 62 (below right) . . . to $80/year for people under the age of 62 (below left). The passes are per passenger vehicle, not per person. According to the NPS website, the National Park System comprises 392 areas covering more than 84 million acres in every state (except Delaware), the District of Columbia, American Samoa, Guam, Puerto Rico, and the Virgin Islands. These areas include national parks, monuments, battlefields, military parks, historical parks, historic sites, lakeshores, seashores, recreation areas, scenic rivers and trails, and the White House. What fun to try to visit as many sites as possible in one's lifetime! Did you know that some foreign visitors have seen more of our national parks than many U.S. citizens have?? 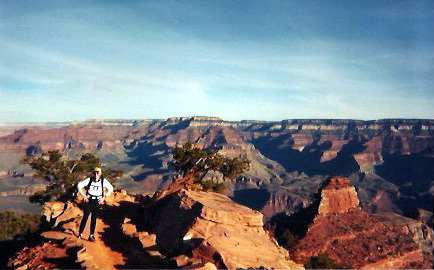 and hiked back up the Bright Angel Trail. There was too much snow to go up to the North Rim. Then consider all the state parks . . . some of those may be closer to your home. 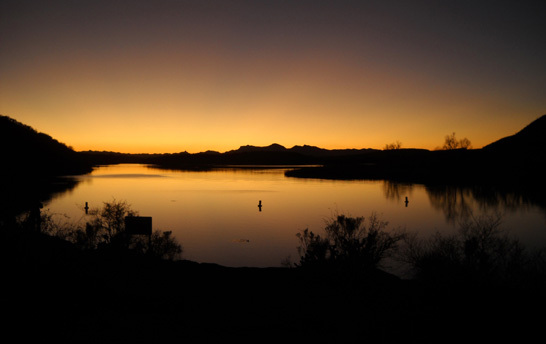 They offer many opportunities for weekend or vacation stays in campgrounds, cabins, and/or lodges, as well as scenic places to run, hike, cycle, fish, watch birds, and pursue other recreational activities. Your entry fees will be put to good use and may help keep the parks open. Ditto any local or regional parks. I don't know how many states offer annual passes. The only one we've purchased is the one I already mentioned in Texas, where we like to spend several weeks or months in the winter. That state has about a hundred parks and historical sites, not as many as California but offering just as much diversity. We are currently enjoying warm spring days at Brazos Bend State Park near the Gulf in southeastern Texas. BBSP has the distinction of having sold the most annual passes of any of the parks in the state system so far this year -- $20,000 more, at the present time (at $60-75 a pop per passenger vehicle). You can bet they are proud of that fact! Stats like that pretty much ensure the viability of this park if others are ever on the chopping block. 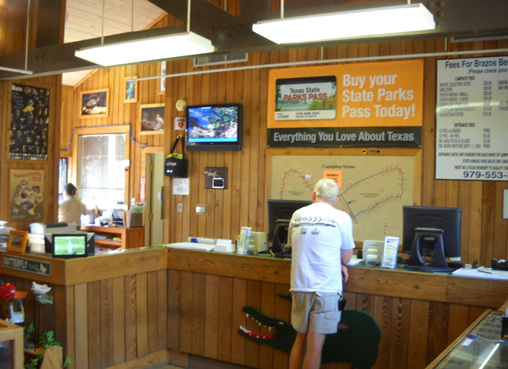 Note the big sign re: TX State Parks passes in the Brazos Bend office at the entrance to the park. Daily, per person entry fees are usually $4-5 at parks in Texas so visitors, especially couples and families, can recoup the cost of a pass after only a few visits to any of the 100-odd parks around the state. In addition, folks with passes get four �-off coupons for camping and other discounts within the park system. The Texas parks pass is a real bargain for Jim and me. Some regional and local parks, such as my old stomping grounds in the eastern Atlanta metro area (Stone Mountain Park), also offer annual passes. Consider buying one or more park passes for your own family and purchasing others for gifts to people you know will enjoy them. I think it's money well spent on several levels. Any other activities you pay for within the parks -- such as camping and lodging fees, food and beverages, boat and equipment rentals, unique transportation like a sky lift or miniature train ride, special programs or shows, gift shop items, and other goods and services that aren't included in the entry fee -- all help to support the parks and provide wonderful memories for you and your family or friends. 3. Volunteer in as many ways and for as much time as you can. 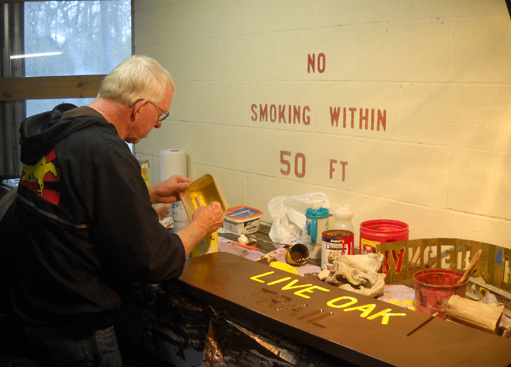 As park budgets shrink, remaining personnel can use all the help we can give them! I think that parks are as good a place as any to voluntarily share your time and expertise. The sky is the limit in this regard. Consider what skills you have and try to match them to the needs of a particular park. Many parks have volunteer coordinators that can facilitate this. If no one is in charge of volunteers, find the appropriate employee in charge of what you'd like to do (visitors center, headquarters/office, maintenance, special activities, etc.) and proceed from there. Examples of volunteer activities that Jim and I have done at all manner of parks are trail construction and maintenance (from local parks to the Appalachian National Scenic Trail, above), cleaning up debris after storm damage, picking up trash left by inconsiderate slobs, working in the visitor center, being campground hosts, assisting visitors with information, folding maps, painting and erecting information, directional, and cautionary signs, and other tasks that assist under-paid and over-worked park staff. Volunteering at a park can be as structured as being an official interpreter, naturalist, story-teller, entertainer, enactor, cartographer, or artist -- or as simple as unofficially picking up litter and fallen branches on a hike, or notifying rangers about recent deadfall they haven't yet discovered. You might be able to help save the demise or deterioration of a park in this manner. Be creative and figure out what you can do to help. To our delight, Jim and I have played a small part in keeping the beautiful wooded single track trails open at Explore Park (above) in the Roanoke, Virginia area. The city and county can't afford to continue to operate it and the individual from out of state who has an option to develop it into a destination resort can't get the necessary funding during this recession -- so the park's visitor center, restaurant, historical buildings, and special activities were shut down a couple years ago to save money. 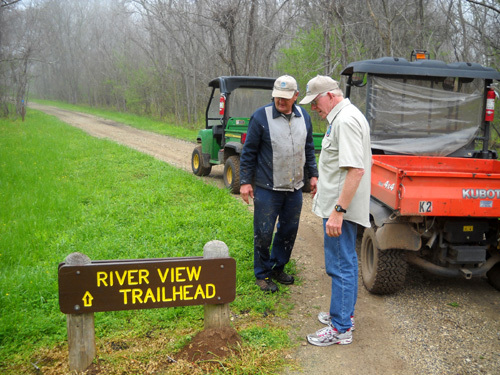 The great thing is, about ten committed volunteers (including us in the weeks when we're in town) became involved in maintaining the trails so they can remain open to runners, hikers, and cyclists. One volunteer is in charge of this group. 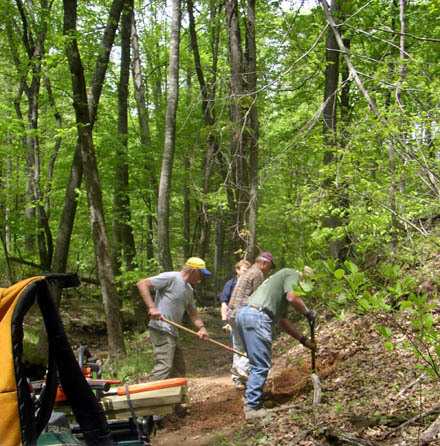 He assigns the rest of us to periods of time for which we are responsible for trail maintenance; he periodically reports to one of the few remaining employees who keeps tabs on park property while it's in this odd state of limbo. Jim and I also try to help out at other local, state, and national parks and forests around the country when we visit them. Often it's informal and no one even knows what we've done. We do it because we care. 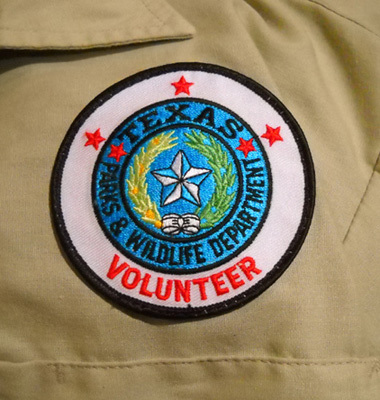 We have enjoyed several Texas state parks so much that we have considered applying to become volunteer campground hosts at one or more of them "someday." That's one good way we can help the state keep its parks open and score free camping in return for some work (our motive isn't entirely altruistic!). Texas isn't "our" state but it's the one where we prefer to camp during the winter -- so we have a personal interest in keeping its parks open. Since we move around fairly often to go to races we hadn't decided where or when we might want to stay put long enough to make it worthwhile to apply to be campground hosts or "work campers." There are opportunities at all levels of parks, all over the country, so simply deciding where and when isn't really so simple. Other obvious choices for us besides Texas in the winter/early spring would be McDowell Mountain or another regional park in the Phoenix area in December and January, or the national forest campgrounds near Silverton, Colorado in the summer (camping is free there, so I guess hosts receive a stipend). We've heard from veteran campground hosts that to land good volunteer jobs at prime locations and months (i.e., winter in a warm spot, summer in a cool one), prospective hosts have to apply early and be able to stay several months. Each park has different requirements and expectations. Having a variety of skills and a good work ethic also help. This month we "accidentally" became campground hosts. We consider it a good trial run and a foot in the door if we decide to apply for another position next winter. 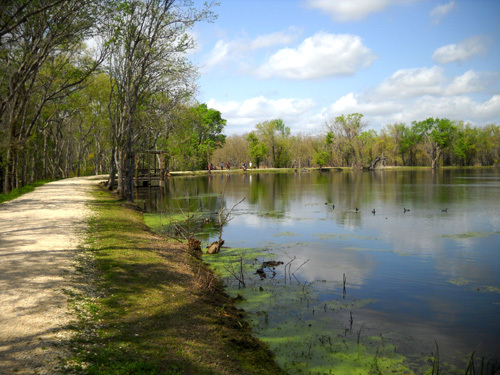 When we arrived at Brazos Bend State Park southwest of Houston at the beginning of March it was our first visit to the park. We came in as regular paid campers for six days. After that we intended to drive to Decatur, Alabama so Jim could run the Delano 12-Hour Run, then spend a couple weeks in the Atlanta area to run a 50K race before heading back to our house near Roanoke. We want to stay south as long as possible until the Roanoke area warms up! During a walk through the two campground loops on our second day at Brazos Bend I noticed something odd: two of the four campground host sites were empty and it was already three days into the month. That made me curious, since springtime is very busy at this large, popular park. Jim and I started asking questions when we introduced ourselves to the hosts in our loop. 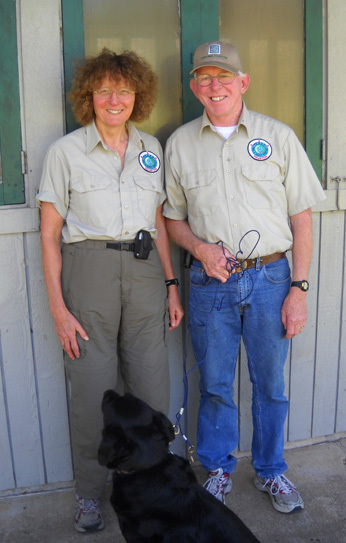 Ben and Bev, a retired couple about our age who have been hosts for several years at various campgrounds around the country, described their responsibilities at Brazos Bend and encouraged us to talk with the park's volunteer coordinator. They were so enthusiastic -- and the weather report for the Delano race was so much colder than it was at Brazos Bend! -- that Jim decided he could easily give up that race. 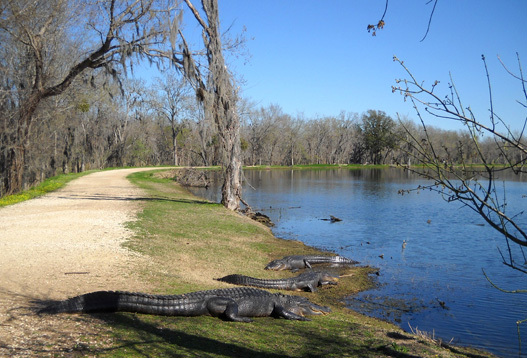 Let's see: hang out in the warm sunshine with cool alligators and 35 miles of trails at Brazos Bend for the whole month or head north in a few days to probable colder, rainy weather and a race that Jim wasn't all that eager to run . . .
Tough decision for a couple of sunbirds, right?? Cody-the-campground-host-dog wants a shirt and hat, too! The park superintendent, office manager, and volunteer coordinator were all happy to hear we were interested in volunteering for the next three weeks. The middle week was the very busy Spring Break week and they were clearly short on campground hosts to handle the mass of humanity they expected to visit the park for most of those nine days (yep, it was packed with families). Plus they thought Jim's carpentry skills would be useful for an addition they plan to build at headquarters and my painting skills would help Ben finish a bunch of signs he was working on all by himself. 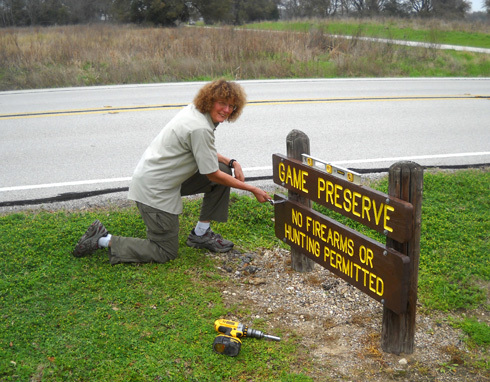 putting the signs back out along the trails and roads, as I'm shown doing below. We filled out our applications, gave permission for a criminal record check, received loaner volunteer shirts and a hat Jim can keep, and enjoyed our last free weekend before beginning "work" the next Monday morning. 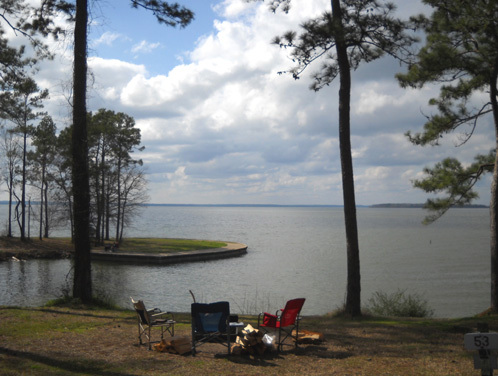 Work camping is a win-win situation for both the volunteers and the park or campground. We win because we get to enjoy the beautiful park and fantastic spring weather for almost a month instead of having to leave before Spring Break (we didn't have CG reservations then and it was full). As campground hosts we get "free" camping for three weeks and would have gotten more if we could have stayed longer. 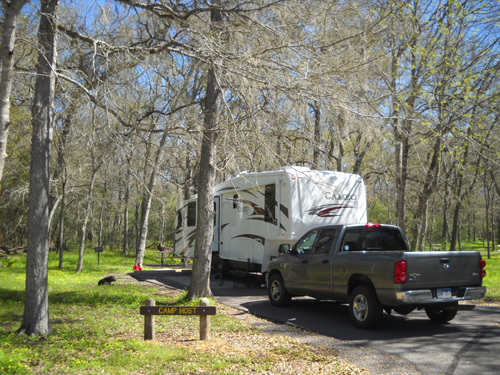 Hosts can stay up to ten months at Texas State Parks, then must move on. An average stay is three months at each park. Regular campsites with water and electric are $20/night at Brazos Bend; the four host sites are the only ones with sewers. That eliminates the hassle of moving the RV to use the dump station or hauling around messy Blue Boys (~ 6-10-gallon containers on wheels in which you can haul black or gray water behind your vehicle to a nearby dump station). Our Cameo looks right at home in a spacious camp host site at Brazos Bend. Brazos Bend Park "wins" because it's getting a bunch of work out of us that it doesn't have to compensate in salaries and benefits. The Texas State Park system requires host couples to put in 25 hours of work per week (together, not each). Like Ben and Bev, however, we quickly discovered that it's easy to do at least ten more hours a week than that and still have plenty of free time. Our extra hours are truly voluntary. It didn't take long for us to take some ownership in "our" park and just naturally want to do more for it, such as picking up trash on all of our walks and runs. The only downsides have been reporting to work earlier than we prefer on Monday through Thursday mornings (we easily modified our hours so we could sleep later!) and having to hear some of the inevitable "office politics" that occur in every organization (is anyone ever satisfied with the folks in charge?). And Jim's a little disappointed because the carpentry work hasn't materialized yet. Other than that, we love our new responsibilities. discussing that big fire ant hill at the base of the right post. You don't want to mess with Texas fire ants! 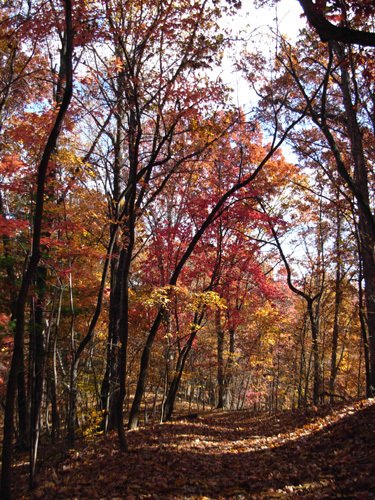 We can take a lot of pride in keeping the trails, picnic areas, and roadways clean. 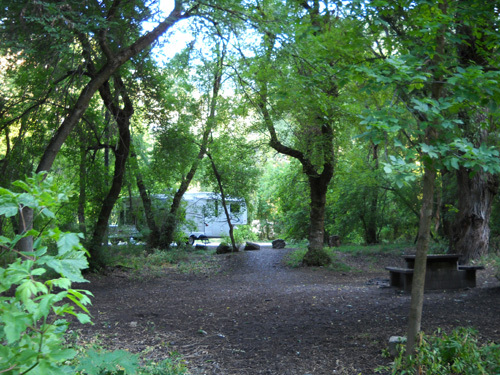 We get to interact with visitors on the trails and in the campgrounds. I get lots of questions when I wear my volunteer shirt on walks around the various lakes. We get to paint and put up nice routed wooden signs all over the park, then run, walk, or ride past them and smile because we know they are a product of our labor. We get to know the other volunteers, several of the more interesting rangers (oh, the stories! ), and some inner workings of the park. Three 'gators enjoy the warm spring sunshine along the trail around Elm Lake at Brazos Bend SP. The largest is at least ten feet long. On cool, cloudy days they stay in the water to keep warmer. But I digress . . . I'll show you lots more photos of the alligators and BBSP in two or more subsequent entries. If we were here longer we'd be trained to work a variety of tasks in the Nature Center and at headquarters. I'd enjoy that. Every park affords a variety of host and volunteer opportunities so skills we learn at one can easily transfer to others. It has been a good education and we have some great stories to tell! 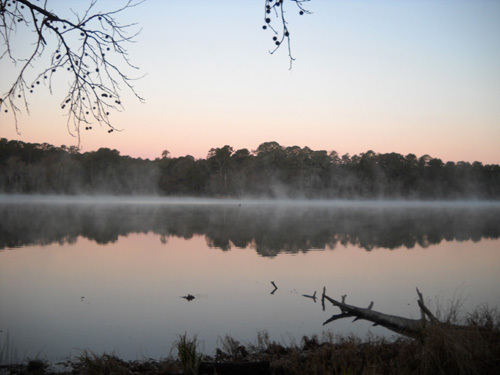 Now that we have some experience and a good reference from Brazos Bend, we will submit our application to the woman who coordinates campground hosts for the whole Texas State Parks system and perhaps end up as hosts next winter at one of our choices of parks. In this series about park closures I hope I've inspired readers to at least think about the fiscal problems facing many of our public parks at the local, state, and national level. Find out what's going on in your own area or the places you like to visit around the country. Even if none of these parks appear to be in jeopardy of being closed, they are still probably in need of your advocacy. Think about ways you can help support them that may cost little or no $$$ but can make a difference. You do have a vested interest in parks, even if it's just helping to sustain your local economy so your taxes don't go up! 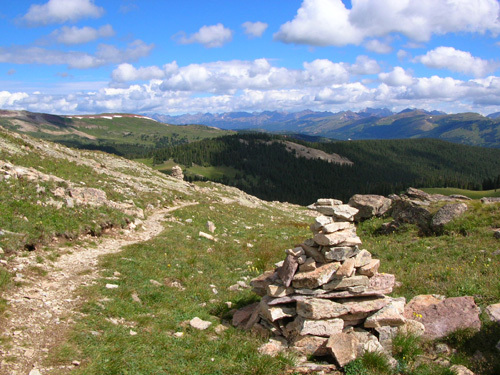 And if you enjoy their beauty, solitude, forests, lakes, trails, lodging/campground, or other features as much as we do . . . you have a lot to lose if they are closed.